Every Thursday morning, you can find Annie Van Leuven hopping onto a golf cart at Fenton Farms Golf Club in Fenton with her daughter Karen, and granddaughter, Camille. Annie, who celebrates her 100th birthday on June 8, has golfed on Fenton Farms Ladies Day for 49 years. It’s a little tougher for her to swing a golf club these days, she admits, so she uses a swingless driver, which drives the ball about 200 yards. 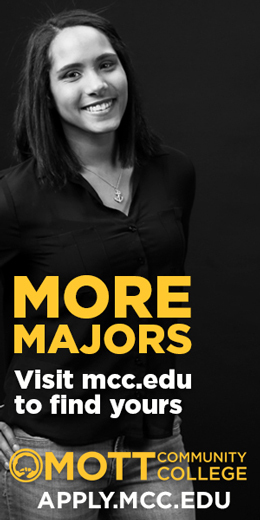 But, she chips and putts unassisted. At one point, she was in the Champion Flight – now in Flight 3, she says she isn’t the worst golfer. “It’s a lot like bowling: some days you’ve got it and some days you don’t,” she laughs. 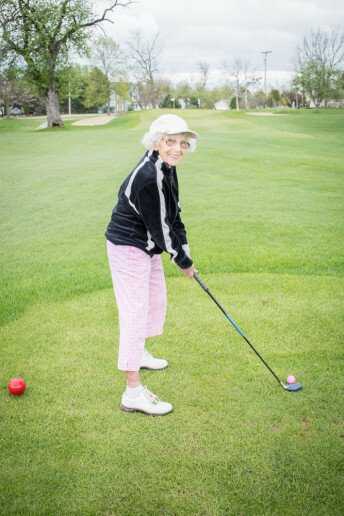 This spunky, soon-to-be-centenarian not only golfs weekly, she drives a brand-new Equinox, lives independently in Burton and enjoys good health. 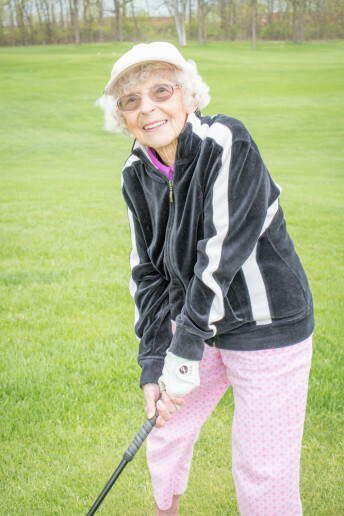 Annie took up golf when she was 50 and remembers when it was considered a man’s game. “Back in the day, women couldn’t go out on the course until after 1pm on Sundays!” she exclaims. Annie was born in 1918 in Trotter, PA, the daughter of Polish immigrants, Anna Wnetrzak and Andrew Jedynak. The family moved to Flint when she was a youngster. She married James Hobson, Sr. when she was 15 years old and they had four children. She now has 11 grandchildren and 23 great grandchildren. “I have five new great-great grandchildren this year,” she shares, with a sparkle in her eyes. After James passed away, Annie met and married William Van Leuven, bringing her another group of children to love and call family. They were married for 14 years, until he passed in 2016. She was always a stay-at-home mother. “Women really didn’t start going to work until World War II,” she says. As one can imagine, Annie has seen a lot of things change during her lifetime. Growing up, her house was without indoor plumbing and she scrubbed clothes on a washboard. “We would wring the clothes out by hand,” she recalls. “I still have that washboard.” She remembers walking down the block to get water from a city pump and carrying the heavy pails back home. There were no cars, televisions, telephones or paved highways at that time. 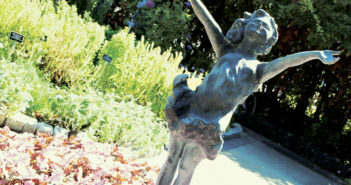 Annie has also seen many changes at Fenton Farms Golf Club over the years, which dates back to the 1930s and has changed names a few times – formerly Long Lake Golf Course, Shore Acres and Torrey Pines. When she first started playing there, it was pretty rough, she remembers. “The golf course is beautiful now. And Chris (White), the owner is so wonderful.” The Thursday Ladies Day at Fenton Farms started prior to 1969, which is when Annie joined, but no formal records were kept prior to that. It isn’t a league, she explains, “you only pay when you play.” It begins in April with a Spring Luncheon and ends in October with an Awards Luncheon. Annie was president of Ladies Day in 1977.